For any number of reasons, a seemingly perfect gun can go boom and come apart. Want to know the lesson you should learn with each of these photos? Know your weapon, and treat every gun like a powerful tool of destruction. Let's look at some pictures of catastrophic gun failures. 1. This Springfield Armory Model 1911 has seen better days. 2. From what appears to be a faulty German military surplus cartridge, this rifle disintegrated! 3. This Colt Anaconda in .44 Magnum may have been done in by a bad hand reloaded cartridge. Double powder charge? 4. A Glock Model 21 .45 acp. pistol appears to have been destroyed using faulty hand loaded ammunition. If you handload your own, watch your overall length and powder charge weights. Never shoot someone else's handloads. Their mistake is your bodily injury or at least a broken gun. 5. This Weatherby died from a double charged cartridge. 6. This accident was due to a shooter trying a so called "hot load." 7. 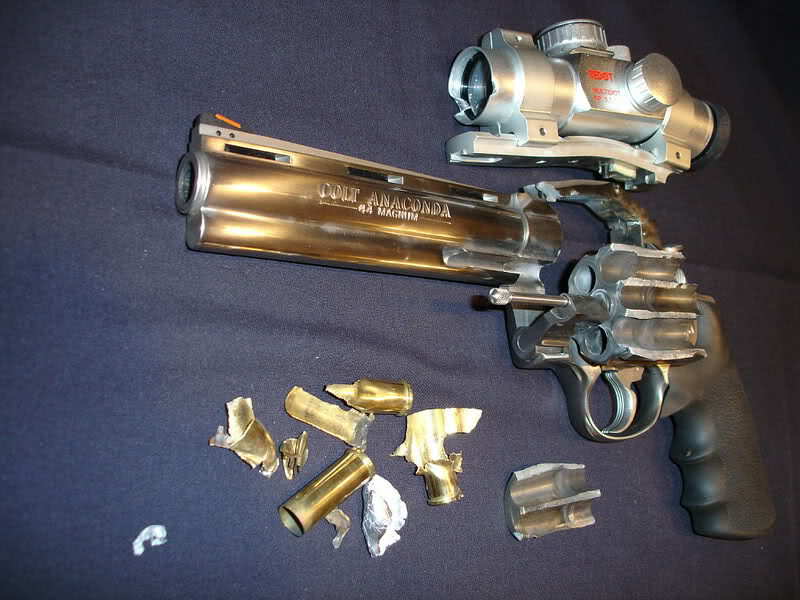 This Ruger LCR pistol failed during a firearms training class with factory ammunition this time. 8. This twisted mass of steel was once a modern shotgun barrel that most likely burst upon firing either a double powder charge or a barrel obstruction.